It was a Hamletian moment but on a much larger canvass. If Hamlet was an individual confronted with doubts, the United Kingdom was a nation faced with a historic and life changing decision. To go or not to go, that was the question. It was the question that faced the British voters as they headed for the polling centres on Thursday to make that vital decision at a referendum, the second referendum connected with European membership since the one held 41 years ago. By a decisive 51.9 per cent of the vote of a high turn-out of 72 per cent, the British people voted to leave the European Union. The decision has not only shocked the British political establishment and the ruling elite but also sent shock waves round the 28-member organization that is bracing itself against the rise of populist nationalism in Europe, calling for a reform of the bureaucrat-ridden EU. As the results began to come and the leave campaign gradually gained momentum as Thursday night turned to Friday morning, the UK suffered its first fatality of this essentially democratic move. 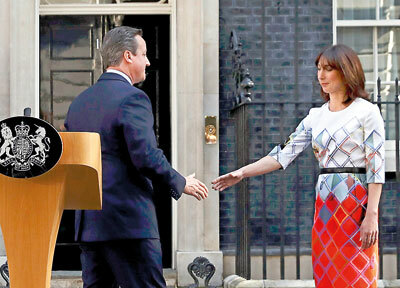 Prime Minister David Cameron fell on his sword. Almost immediately the result became clear David Cameron announced that he will be stepping down from the premiership by October when the Conservative Party will be holding its annual conference and giving time for those aspiring to succeed him to throw their hats into the ring for the leadership contest. It was a gesture in the best traditions of parliamentary democracy, a lesson that Sri Lankan politicians could learn but would rather prefer to maintain their tone-deaf arrogance. In Sri Lanka, which only some days ago sent emissaries to London to lobby persons of Sri Lankan origin to try and save Cameron’s bacon by voting to remain in the EU such political niceties are as far away from the conduct of our politicians as Socrates from a swine herd. It would take some physical power to drag our reluctant politicians from their seats of power and influence that often clear the way for corruption and abuse. But it seems that it is not only Cameron who would be on his way out. By late Friday morning a motion of no-confidence against Labour Party and opposition leader Jeremy Corbyn was on the cards. If Cameron decided to commit hara kiri, Corbyn like Julius Caesar is being prepared for knife-wielding members of his own party to perform the last rites on his short-lived leadership, all done in the democratic tradition of course. So this referendum has turned British politics on its head. It is surely the first time in living memory that both the prime minister and the opposition leader are in for the chop in response to the voice of public opinion. This referendum is historic not merely because the UK has voted to exit the EU but also because it has kicked the British ruling class and reminded it to listen attentively to the voice and the needs of its people. It is indeed a pity that our law makers were not around to listen to the measured, sober, and calming statements that were made by David Cameron and later by Conservative Party front runners of the “leave” campaign such as Justice Minister Michael Gove and former London Mayor and MP Boris Johnson who expressed sadness at Cameron’s decision to resign. They were among 84 Conservative MPs who had written to Cameron urging him to remain as Prime Minister in the event the people voted to leave. On Friday morning Johnson and Gove paid tribute to Cameron for providing leadership and for the steps taken to restore confidence in the British economy. The civilized manner in which leaders of the Conservative Party but on either side of the referendum divide acted in the post-referendum hours would surely be a valuable learning curve for those in the frontline of Sri Lankan politics or aspiring to get there, if only they were willing to learn. These divisions that became ferocious during the campaign were not settled by fisticuffs in the Well of the Parliamentary chamber or its environs but in the best traditions of democratic practice and civilized conduct. That the vote brought to the fore the divisions in British society and the chasm that exists between the political establishment and the ruling elite on the one hand and public opinion on the other cannot be papered over easily. It is a hard fact that the country is badly divided. It was London, Scotland and Northern Ireland that voted overwhelmingly for the country to continue in the EU. The rest of the country, irrespective of party affiliations voted indisputably for the UK to leave the Brussels-governed EU which was turning increasingly opaque, was largely unaccountable and clearly undemocratic. The UK’s relations with the EU and whether the country should continue to remain in this expanding union is a question that has haunted Britain for several years. The UK’s vote to leave comes at a time when there are clear noises being made by other European leaders and political groups on whether unelected bureaucrats in Brussels should be allowed to impose laws and rules which are not in the interests of member states. The questions asked is whether they should not wrest decision-making away from highly-paid bureaucrats and take control of their own affairs. A reason for this is not just the rise of rightist nationalism in Europe but the fact that the reforms that Brussels bureaucrats have promised have rarely happened increasing the Euro-skeptic mood in Europe. Cameron need not have called this second referendum on Europe as he did two years or so ago. But with rumblings within his own party over Europe and skepticism over Europe gathering momentum Cameron promised a referendum in an attempt to settle inner-party differences. Whatever might be said in mitigation by some analysts trying to cover up the divisions in the country exposed by this vote, the truth is that the United Kingdom is divided by nations, by class, by education and by region. Let there be no mistake. This was not just about whether to leave or stay in the EU. This was a referendum used by voters to express their anger at the lowering of living standards, of depressed wages blamed on virtually uncontrollable immigration from the EU which allows free movement of people and the feeling that state institutions and facilities are failing to serve them. This was a clear and loud public signal that they have had enough of the ruling class messing up their lives, a message that cut across party lines. People voted on the basis of their individual social circumstances and the EU referendum provided an opportunity to convey their message to the ruling elites. It was a point this column made when Sri Lankan leaders decided to fly in their own politicians to virtually tell the Sri Lanka community to vote to remain. You cannot simply send people who do not live here and do not know the problems of daily existence for them and their families to tell them how to vote. In the end these Sri Lankan politicians running around lecturing and hectoring turned out to be quite a joke. It smacked of sheer arrogance to even imagine that the views of these leaders and their admonitions will change how people living here and driven by their own concerns think. And now that the British people have spoken those who tried to influence the Sri Lankan community to follow them blindly, will need to rethink their own position having urged the community to help the UK continue its partnership in the EU. The Brussels bureaucrats are not without concerns either. Given the changing mood in Europe they must wonder whether the UK’s decision will prove contagious and will spread to other member states demanding of their leaders an opportunity like the UK to express their views on the EU. It must be admitted that the political establishment has not covered itself with glory during the referendum campaign. British politics has not seen such fractious moments as the main parties were divided within themselves. Now a healing process has to begin to cement those cracks that have appeared between parties and their supporters and the public. Of course given the constitutional and legal issues involved in UK pulling out, the disintegration is not going to happen overnight. It will take time depending on how the two sides approach this political divorce. While those issues are being sorted out and negotiated, there is another question that hovers in the air. Will Scotland now think of going for a second referendum seeking independence so that it could join the EU? At the last referendum on independence Scotland voted to remain with England. But if it goes for another referendum now that the UK has decided to quit the EU would Scottish public opinion change and Scotland opt for independence writing finis to the United Kingdom? Thursday was Britain’s revolution. There was no blood-letting. But this country will not be same again.